Writing a biography review can be challenging, because you have to not only read the chosen biography book but also acquaint yourself with the subject of the biographer in order to evaluate the author’s work in a good and objective manner. Below, we will teach you step by step how to write a book review on a biography. What Is a Biography Review? A biographical book describes a person’s life in detail. It can be objective or biased, formal or informal. A biography review includes a brief overview of the biography book, analysis of its main points, and a personal opinion on the book. The biography review doesn’t evaluate the subject of the biographer but his or her writing style and qualifications, the reliability and quality of the provided facts, and the author’s ideas and statements. A biography review is aimed at two fundamental goals: to present the biography book to the potential readers and to provide them with your personal opinion and recommendations. There is no unique standard for a biography review. Some sources offer to divide your paper into two equal parts: the summary of the author’s main points and your personal opinion on the book. The others underscore the importance of the profound analysis in comparison with personal critics. However, it is necessary to check the instructions before you start writing your biography review. You can also include some information about the person who is the subject of the biography. It will be a helpful addition, especially if your targeted audience is not aware of the general facts about this personality or the subject of the biographer is not well-known. – the author’s qualifications (make sure that the biography was written by a professional with appropriate education and vast experience). Don’t neglect the value of the notes! Your memory can’t conserve all necessary details that you will need for writing a cogent review. The importance of the notes is also hard to overestimate when it comes to quotation. If you are not the lucky owner of an eidetic memory, taking notes is the only way to gather crucial information while reading a bio. One more tip: before writing your own biography review, we highly recommend reading professional biography reviews. This method is utterly helpful for those who write their first review on a biographical book. The samples will help you to learn more about structure, peculiarities, and formatting of your own papers. What is the author’s purpose? Did he or she manage to achieve it? What are the writer’s main points? Did he or she emphasize certain facts? Why? Is this biographical book related to other works about the same person? What kind of research did the author conduct? What sources did he or she use? What is the author’s targeted audience? Is this book interesting for general readers? What language does the author use: formal/informal, common/specific? What is the writer’s tone of voice: convincing, indifferent, accusatory? Does the biographical book include new facts which were previously unknown? Does the author omit some crucial facts? Read a chosen book from A to Z. Don’t forget to take notes! You should write down your impressions, distinctive quotes, and page numbers where you get the quotes from. After you read the book and form your personal opinion about it, you can read other critics’ reviews. Under no circumstances should you read the reviews BEFORE reading the book. There is a risk that your personal opinion will be affected by already existing ones. Planning is half of success. Create a detailed outline of your biography review. For illustrative purposes, you can use diagrams, tables, and lists. In the first paragraph, you should include the essential information about the book that you review: title, author, subject, date of publication, awards, etc. After reading this paragraph, your readers should understand clearly whether this review is useful for them or not. Provide your readers with general information about the biographer and the subject of his or her work. Mention the connection between them if they are friends, relatives, or colleagues. Investigate the premise of the book, the history of writing, and the public reaction. 6. Examine the main points. As mentioned above, your biography review should include the two biggest parts: a summary of the author’s ideas and their objective evaluation. You can define the balance between the two aspects on your own or ask for instructions. However, don’t let your writing be baseless. Whether you analyze the book or provide your personal thoughts, always enforce your points with examples, pieces of evidence, and quotations. 7. Be objective and attentive. If you don’t mention any weaknesses of the book, it may seem that you are not objective. Sometimes, it is difficult to criticize a professional writer, so pay attention to the details: the readability of the text, the novelty of the provided facts, the possible bias, etc. 8. Leave comments on additional material. If there is any additional material like photos, maps, or a glossary in the book, define their function. 9. Enter the home stretch. In the conclusion, you summarize your overall impression from the biographical book. Don’t forget to include some recommendations for future readers! Avoid the clichés such as “I like this book very much” or “the book is interesting.” Use more specific vocabulary: “compelling,” “credible,” “educative,” etc. 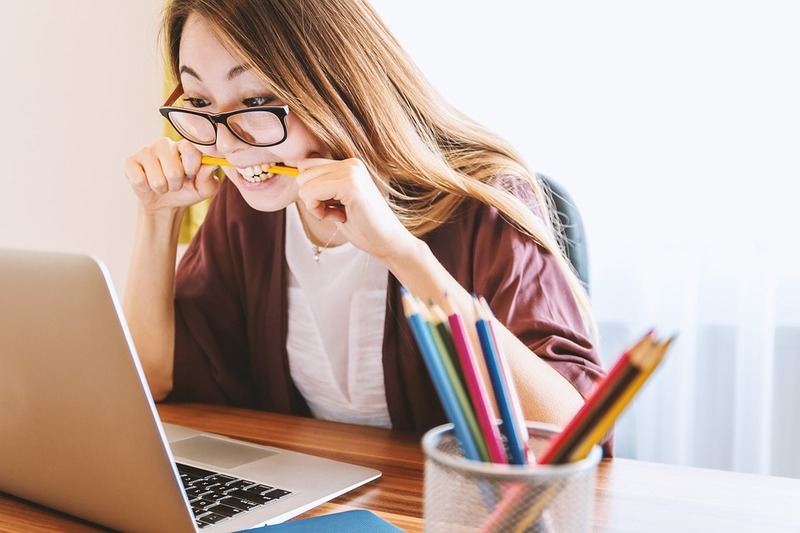 There are three main steps you should take to bring your biography review to perfection: have a rest to clear your mind, reread your text two or three times to correct mistakes, and get feedback from your peers, parents, friends, or colleagues. The best way to learn how to write a book review on a biography is to get an appropriate example. 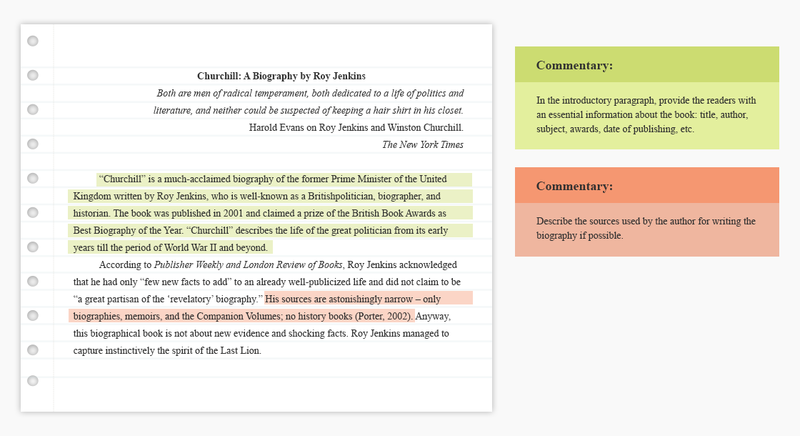 Below, you can see a biographical book review sample with the comments of our specialist who analyzes the structure and the elements of the review. You can use these comments as additional instructions while writing your own paper. When you quote the author, mention the page number in order to help your reader to find the paragraph you’ve used. Be reasonable! Don’t try to read and analyze a five hundred page bio in one day. Always manage your time carefully. Remember the word-count limit, especially if it is specified in the instructions. However, a biography review is usually about 700-800 words. Don’t be afraid to express your personal opinion. All in all, it is YOUR biography review. You are free to write whatever you think, just don’t cross the reasonable limits. Although there is no strict rule for tense use, be consistent in the use of tenses in your biography review. There is no place for general and neutral phrases in the reviews. You should express your opinion openly whether you like the biography or not. Follow the principle of the “golden mean” when you quote the text. The quotations are indispensable for every review. At the same time, they shouldn’t be too long just to fit the word limit. Now, you have all necessary information to create a correct, objective, and well-structured biography review. You’re welcome! You are also welcome to look through our guide on how to write an autobiography. We are always ready to help our curious readers and show them the right way to academic success. The skills of critical analysis can be useful in a wide range of everyday situations. So, the additional practice will help you to develop your critical thinking and understanding of complex issues in any field of study. Moreover, the writing of the biography review is a great way to learn more about renowned artists, scientists, politicians, and their legacy.